I haven’t cleaned behind the fridge in quite some time. I could actually tell you exactly how long it’s been, but I don’t think numbers are important. I know you’re with me on this. However, a bunch of grease got spilled in the kitchen and some of it went under the fridge, and that’s beyond the pale, even for me. So the fridge came out. It was not nearly as bad as I thought it would be back there. We were taking bets on how many magnetized alphabet letters would be under there, because they disappear off the front of the refrigerator like they’re vaporizing. Once we were speculating about what happened to them, and literally while we were talking, one of the boys picked an X off the door and carefully slid it underneath. Because we’d never told him not to, I guess? I think we started with two full sets, so we were expecting around thirty letters under there. There were nine. The others, as I said in a text to my sister, have disappeared into the vortex with all the partners of mismatched socks and my sanity. Never to be heard from again, I’m sure. I think I’m having a post-holiday slump. Which is a little funny, considering how I feel about the whole season in the first place. It might be a bit like trying to meet a monster deadline at work – stressful, but boy does it give you focus. Once you’re done, even though you’re free, it’s a little disorienting. And not as much fun as you’d hoped. And I desperately need my routine back. So do my children. 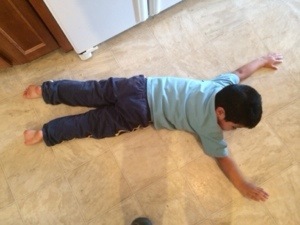 Elias actually prostrated himself on the floor the other day, sobbing. I would not give him a popsicle. I am such a jerk. Who needs a routine again. I’m getting a lot better at being flexible and rolling with it, but I have a long way to go. Levi is supposed to start preschool again tomorrow, but with the big cold snap coming, I’m afraid school is going to be cancelled on Monday and Tuesday, and … I might cry a little. I need a normal week. I did, however, have one moment of zen last week. 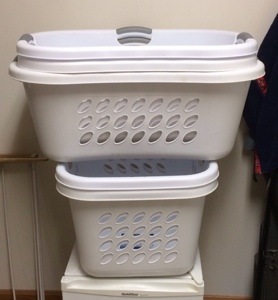 That is all the laundry baskets I own. Empty.